Project Lead The Way has been implemented in Liberty Public Schools for several years now, and the impact is beginning to show. Students of all ages can now be involved in individualized projects that provide them with problem-solving skills enabling them to be future leaders. “This is Project Based Learning, so the kids are really focusing on being individual learners or independent learners. They come in and they investigate things and they research things, they’re doing animations or drawings, summarizing, or collaborating, building models and that’s a lot different than the stand and deliver type of classroom where you just go in and somebody lectures from the time you walk in till the time you leave, so that’s changed a lot, the way science is taught,” Biomedical Project Lead The Way teacher Barbara Williams said. The opportunity to gain these types of skills has also been extended to elementary schoolers in the district and now every student in the district is exposed to new ways of thinking. “Every student becomes proficient at using the Scientific Inquiry method to investigate the world around them and they really begin to own the Engineering Design Process, recognizing things around them they can improve and make better. As critical thinkers, they inherently see a need to research to make their designs better and to collaborate to benefit from others’ ideas and expertise. Those communication skills priorities are easy to incorporate because they are so necessary in working together through the challenge,” Project Lead The Way Master teacher Cammy Neth said. The Project Lead The Way program is set up differently for elementary and secondary levels of education, but the idea of learning through projects instead of lectures is a common theme. Most PLTW classes work through problems that help them experience real-world examples. “The problem is based in a story situation with three recurring characters: Angelina, Milo, and Suzi, which age up through the grades with the children. Teachers work hard to connect the problems to real-life experiences: second grade took their seed spreaders and created a garden near our entrance, third grade toured a retired aircraft to help them revise their aerospace creations, and after a microbes module fifth grade noticed the difference in faucets (handles or motion-sensored) in our older and newer parts of our building and collected data on the correlation of sickness rates based on the types of sinks students use,” Neth said. This unique way of learning helps show students what real-world applications an engineering or BioMed class has and what to expect in the future. “The way we do things we have a lot of projects and a lot of application, instead of reading out of a textbook and learning that way. So, with that, it just helps you get a better experience as to what it is actually going to be like, as compared to just reading about other peoples’ experiences with it. I think it’s really helpful and I think a lot of students should take it. It helps you get a better idea of what you want to do in the future and you can decide if you like PLTW or if you don’t before you make that choice going into college,” junior Austin Burnett said. This program really helps to prepare students for college and careers by equipping them with the knowledge and techniques to get ahead. “I think it’s a really good program. It exposes students to a lot of different things and I like the fact that I have pretty good lab techniques because that’s going to help me in college and a lot of people go in as a freshman and don’t know how to use a pipette or something like that,” senior Mackenzie Gibson said. High schoolers and middle schoolers have been able to experience this learning style for a while now, but the PLTW program has made its way down to the elementary level and there are still changes being made to develop the program even farther. “When we adopted Launch in 2014, there were only 2 engineering modules for each grade K-5. The following year we added a Biomed and computer science module for all grades K-5. In all, there are 24 modules from grades K-5 built from those 3 pathways. This year a pilot has started for a preschool curriculum, so in the future, we could have students enter with experience in the Design Process,” Neth said. The way PLTW is set up at the elementary level looks a bit different than the high school or elementary levels in that it includes all three pathways- BioMed, computer science, and engineering- instead of students just picking one to focus in on. This gives elementary students the chance to decide what they are interested in before the choose one pathway. “In elementary, all students are involved in PLTW’s three pathways: Biomed, computer science and engineering, therefore students learn to enjoy STEM topics they might not have chose to participate in on their own. We are knocking down preconceived notions that ‘I’m not good at math, coding, etc.’ because they are so motivated to solve the problem they don’t mind learning the skill it takes to do so,” Neth said. Though the program is newer to the younger students in the district, there seems to be no problem with getting K-12 students interested in individualized learning. “All kids are curious about the world and elementary kids still have a great sense of wonder, so there’s not much “work” in getting them interested in the program. 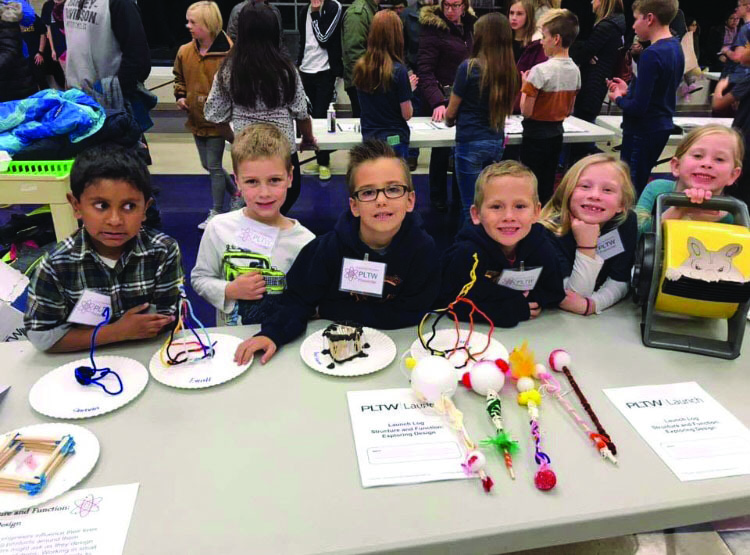 Much like older grades, PLTW Launch students encounter a real-life problem to solve in each module and students have a chance to partner their creativity with the skills and knowledge they gain in the module to design a solution,” Neth said. Students at the middle school level are also interested in the program because of the creativity they get to express and a little bit of competition. “We try to get students interested in the program through competition within projects, showing off projects to the school and using our WIN time for enrichment activities. We have great leadership at the high school levels and the right people at the middle school levels to get kids excited about using their creativity and problem-solving skills through projects,” Engineering Project Lead The Way teacher Andrew Hoskins said. Here at North, the PLTW programs are more tailored to specific interests, as they are designed to help students with future career paths. “We try to encourage students that are interested in some type of medical field to take the program. This whole program was created so that kids interested in a biomedical field knows what type careers that looks like and when they get done with high school they can go straight into college with whatever career pathways they’re interested in,” Williams said. Students taking PLTW classes at North know that their teachers are responsible for their engineering and BioMed classes resembling actual college-level courses. “I know that our teaching staff, they talk to a lot of colleges about what they do and their programs and I know they implement a lot of that stuff. It helps a lot for our students to get a view into it early, so that way you see pretty much exactly what you’re going to do in college,” Burnett said. Teachers all over the district share this same passion of spreading creative learning that helps students become independent learners. “Liberty has embraced design thinking and given ownership to our teachers and students. Just like in PLTW, there are grade-level criteria and constraints that must be met, but compared to many districts Liberty teachers have much more flexibility to design units and experiences that best match their students’ interests and needs to the required learning standards. By passing that sense of inquiry along to their students, teachers experience increased engagement and performance levels. No one wants to go back to textbooks, etc. once they have experienced 21st-century learning options,” Neth said. The Liberty Public Schools District has not only allowed students to explore their interests with the PLTW program, but they have also introduced the program at all levels of education so that every student can strive to hit their full potential. “Our other advantage in Liberty is our strong pathway from K-12 through the three PLTW pathways; the middle and high school teachers have been so supportive of our introduction to our youngest students. They are starting to receive the first groups of Launch users and they notice the difference in aptitude, creativity, and flexibility; when something does not go right, our students have been trained to look for other options, not just a teacher to solve it for them. They are more self-directed and make more connections to the real world. Colleen Jones does a fabulous job of making real-life connections for our teachers and students and when students are able to mentor and showcase their work with people who work in the real-life fields they study it makes learning more fun and relatable,” Neth said. The Kansas City and Liberty area benefits from introducing students to PLTW and was even chosen to host the Kansas City Project Lead the Way Summit because all students in the district get to experience this new type of learning. “The Kansas City Project Lead the Way Summit is one of four national events held this school year for PLTW teachers and administrators ranging across all grade levels. Kansas City was selected to host because of the ideal STEM ecosystem we provide to develop students in K-12, and aligning them with area colleges and tech schools, community and government partnerships, major industries like Ford, and businesses like Burns and McDonnell Engineering and Cerner’s Biomed computer science who are looking to hire students into their STEM fields. The KC STEM Alliance, funded by the Kauffman Foundation is the envy of so many major cities, we are lucky our economy benefits from the opportunities that are being developed by these partnerships,” Neth said. Overall, the “real world” application aspects of the PLTW courses provide students with skills they will need in their future career, but more realistic applications could be added to the curriculum at higher levels of education. “A lot of the application is good but it’s still very disconnected from reality. Last year we built marble sorters, which have some connection to reality but at the same time who is ever going to be designing a marble sorter with plastic cups and cardboard. It teaches you practical skills but maybe not completely practical applications,” junior Ben Svoboda said. To learn more about the Project Lead The Way program and the Liberty Public School District please visit the links below. Students in the Liberty Public School District also have the opportunity to present their own innovative projects at the Project Lead The Way Senior Showcase put on by the KC STEM Alliance, which you can learn more about at the link you can access below.